When we met one of us was involved in roller derby but after a few leg breaks we had to find another accepting competitive sport. Connie started powerlifting-style training as a means to improve roller derby so it seemed a natural transition. At our first competition we were overwhelmed at how accepting everyone was and quickly made friends with people who were very supportive of us as a couple and forward thinking in their views of gender and sexual identity, which was a relief. 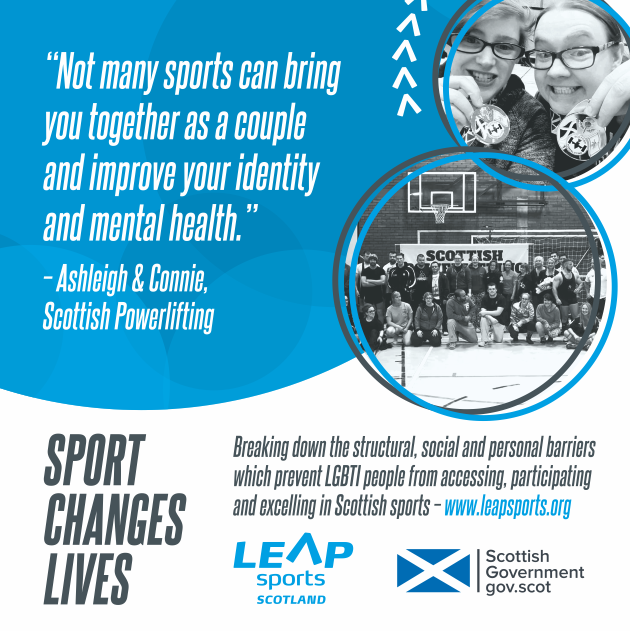 There is still some improvement to be made, but Scottish Powerlifting’s Diversity Officer has been working with equality organisations to continue these positive steps in the right direction. We both have a history with anxiety disorders and in the past have struggled to overcome the feeling of not being fit enough or belonging. Although powerlifting isn’t necessarily a team sport, there is a strong feeling of belonging and support. are actually capable of instead of letting the anxiety of these situations take over. We love that we can train together and compete together while still planning our marriage and the starting of a family. Not many sports can bring you together as a couple and improve your identity and mental health, but with powerlifting we feel we’ve got all that and are very excited for our future and the future of the sport! Scottish Powerlifting is a hugely diverse and inclusive sporting organisation, with members as far afield as Hawick and Orkney, ages 16 to 74 and everything inbetween. If you can pick up a rucksack, or a shopping bag – you can pick up a barbell. Written on 13th January 2017.